Some people use string, twine or yarn, and others even use recycled bicycle tubes or re-purposed telephone or cable wires. While most trellises are functional as well as pleasing to the eye, some are designed solely for visual appreciation. Intricate carvings, wood burning and creative sculpture are incorporated into the most ostentatious of trellises; these typically don't host climbing plants. While the exact date the trellis was invented and first utilized is unknown - and likely won't be - many famous writers, historians, botanists and gardeners have written about and provided valuable information about garden design in general and trellises, specifically. 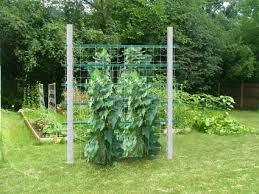 Pliny the Younger wrote about trellises in his letters about gardens in the first and second centuries. Where is a Trellis Used? Trellises are often used in gardens and on walkways, as their primary purpose is to support climbing vines, flowers and other plants. 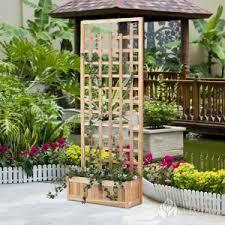 Sometimes trellises are also displayed indoors in courtyards to display rare, colorful or pleasantly-scented plants. In modern decor, trellises are used to hang pictures, pots and pans, coats, ties, necklaces and many other household items. Placed in a garage, bedroom, bathroom, kitchen or just about any other room, the addition of a trellis can increase storage space while creating an appealing visual effect. How is a Trellis Made? A trellis is made in a variety of ways, depending on construction material, region, method and intended use. Commonly metal, wood or plastic is secured into a latticed structure vertically. This structure is supported with a frame. Some trellises are designed for posting - a process where a hole is dug and trellis extensions are secured in the ground. Other designs are secured to an existing fence or the side of a building for plants like climbing roses, traditional English ivy or other plants. However a trellis is intended for use, or how a trellis is made, it can be a valuable addition to many gardens and interior spaces. Climbing plants are pleasant to the eye and can smell great as well, so it’s not surprising trellises have provided pleasure and function for thousands of years.